Valganciclovir (hydrochloride), the L-valyl ester of ganciclovir, is actually a prodrug for ganciclovir. Valganciclovir is an antiviral medication used to treat cytomegalovirus infections. Valganciclovir, the L-valyl ester of ganciclovir, is actually a prodrug for ganciclovir. Valganciclovir is an antiviral medication used to treat cytomegalovirus infections. Tomeglovir is a potent anti-CMV agent, inhibiting processing of viral DNA-concatemers, with IC50s of 0.34 μM and 0.039 μM for HCMV and MCMV. Brivudine was shown to be a potent inhibitor. Cidofovir dihydrate is the dihydrate of the anhydrous form of cidofovir. A nucleoside analogue, it is an injectable antiviral used for the treatment of cytomegalovirus (CMV) retinitis in AIDS patients. 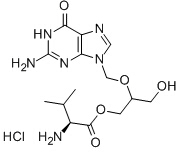 CMX001 (hexadecyloxypropyl cidofovir, HDP-CDV) was developed as an orally active, lipophilic form of cidofovir (CDV). Maribavir(GW257406X; BW1263W94; 1263W94) inhibits HCMV replication is by inhibition of an HCMV encoded protein kinase enzyme called UL97 or pUL97. Letermovir is a novel inhibitor of CMV, which targets the viral terminase complex and remains active against virus resistant to DNA polymerase inhibitors.